Kong: Skull Island is a focus-grouped action movie franchise launch, but it’s clever and artistic enough to avoid being disposable and forgettable. There’s a lot that Kong: Skull Island gets right. Making it a post-Vietnam War period piece is the first, most obvious good idea. Peter Jackson’s King Kong was a period piece, too, but it felt like a tedious, overlong homage to the original. Skull Island doesn’t feel like it’s paying homage to the 1976 version so much as agreeing with that movie that the 1970s were a pretty rad time for giant ape cinema. (Not a great time for Jeff Bridges, though). The setting is about 95% visual and only 5% thematic. The whole thing is infused with a sense of the futility of war, paranoia about conspiracies and shadow governments, pessimism about man’s ability to solve problems, and a burgeoning sense of respect for the environment. I honestly couldn’t tell you if all of that is actually in the movie, or if it’s just subliminal holdover from a childhood in the 70s. Regardless of whether they wanted the post-war attitude, though, they absolutely wanted the post-war aesthetic. 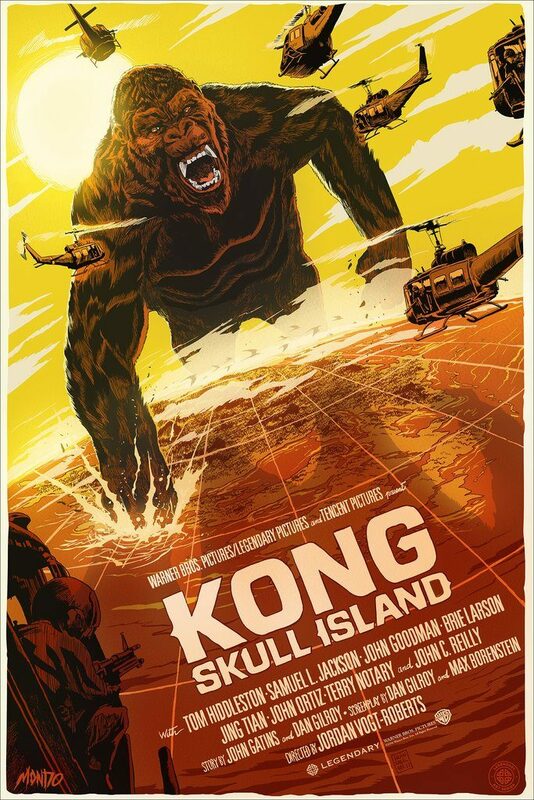 The Apocalypse Now homages are visible throughout all of the marketing, but the designers of Kong: Skull Island were clearly going for the Deep Cuts. Costumes, cameras, ordinance, and electronics are all chosen as if they were being used by the Dharma Initiative. In the beginning of the movie, there are several shots of rotary phones that seem to fetishize them as even more fascinating and exotic than giant spiders. For me, the end result is that the entire movie feels like an animated Mondo poster. (Ironically, this is the one time I actually prefer the movie’s actual marketing to the Mondo versions). There’s an aggressive sense of aesthetics all throughout the movie: every shot is lit or framed or color graded to look like graphic design as much as cinematography. Most of the fight sequences feel like transitions from one storyboard to the next; Kong will smack a giant skullcrawler into the frame and the pose looks almost like something from the opening of Batman. The reason I mention Mondo is because the design seems as conceptual as it is graphic. The aesthetics are chosen for their connotations; it cleverly plays on nostalgia, familiarity, and audience expectations. Skull Island isn’t as full of direct reference to Apocalypse Now (or Platoon, or Full Metal Jacket) as the trailers suggested, but it feels like it’s making constant references to it because the imagery is so potent. Ultimately, though, it feels about as deep as an animated Mondo poster, too. The movie’s entertaining and never feels dull, but there’s almost nothing surprising about it, either. (“Almost” because I wasn’t expecting the moment that introduced the giant spiders). It’s clever, but it doesn’t say anything apart from the standard “respect the majesty of nature” you’d expect from any respectable King Kong story. The characters exist only to have a dramatic entrance and, where possible, a dramatic death scene, with no arc or change in between. And really, that’s fine for an action movie. The downside is that it made it feel more like a slasher movie than a monster movie, where impactful death scenes had to be shoehorned in even when pacing hadn’t allowed for any genuine characterization or sense of attachment. Plus, I’d been hoping they’d be modern and clever enough to sidestep any romance, but the leads do end up falling in love for no reason. I’m assuming that the lack of anything surprising or challenging is largely due to aggressive focus-group testing and franchise building. I didn’t follow any of the pre-release marketing or gossip around Kong: Skull Island, but I’ve heard that Kong grew dramatically between the first teasers and the finished movie. Even without knowing the backstory, it’s clear in some parts that any sharp edges had been thoroughly sanded down over the course of production, and it’s clear that other scenes were stitched together as best they could despite continuity-breaking changes. (For instance: somehow Kong manages to reach inside a monster and pull out its guts while simultaneously holding a human unharmed wrapped up inside his fist. This bothers my suspension of disbelief even more than the notion of an ape that can hold a human unharmed inside its fist). And I’m not sure why we’re supposed to be coy and secretive about the post-credits sequence; it couldn’t be more obvious what franchise they’re trying to build. They put “from the producers of Godzilla” all over the marketing, and I’m skeptical that they’re banking on the tremendous success of the most recent Godzilla movie. Kong: Skull Island is much, much better than the 2014 Godzilla, and it’s actually much better than a monster movie needs to be. (I enjoyed it a lot more than Peter Jackson’s Kong, too). That’s almost entirely due to casting — John C Reilly is the only one given anything to work with, but every actor makes the absolute best of his or her part — and set direction, which is where all the creativity lies. I still say that the secret to the Marvel Cinematic Universe’s success is that they were brave enough to allow for auteur-driven franchise installments. So Joe Johnston could remake The Rocketeer with a bigger budget, and Jon Favreau could turn Iron Man into an indie romantic comedy, and Joss Whedon could continue to kill off beloved side characters at the beginning of Act 3. Kong: Skull Island doesn’t have any sense of being an artist’s personal work; it feels like an artist came up with a high concept and an aesthetic but wasn’t allowed to follow through completely. It leaves me wondering what could’ve happened if they’d tried to be weirder and more original. P.S. The “related links” at the end of this post took me to my earlier review of Peter Jackson’s King Kong, which I hadn’t read in 12 years. Apparently I loved it at the time, which is not how I remember it at all. Maybe I was a lot easier to please at the time, because now I just remember its being three hours of Jack Black and Adrian Brody-filled tedium and maudlin scenes in Central Park. I guess I’m due for a re-watch, but to be honest I’d rather just ride the Universal Studios Hollywood tour again.